Thanks to all the artists, volunteers, and attendees who made the 2016 Show and Sale a huge success. Below are some of the 2000 items our members made and displayed this year. Have you ever learned something new and then got to travel and continue your education? What fun that would be. Janis Johnson our speaker got that opportunity. Janis’s life-long hobby has been learning how to make things. 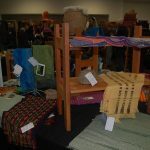 She started weaving on a rigid heddle loom in 2001, learning from books. Janis didn’t start weaving on a floor loom until 2010 during her second term as president of the Portland Handweavers Guild, when she thought it would be a good idea to understand what people were talking about. Little did she know that it would become an obsession, with learning opportunities for a lifetime. Because Janis had taken a guild workshop on weaving velvet with Barbara Setsu Pickett, she received email about an opening in Barbara’s program through the University of Oregon to weave on manual Jacquard looms at the Lisio Foundation for Silk Arts in Florence, Italy. Janis had first learned about Jacquard looms in an early computer science class and found them fascinating, so she jumped at the chance. Please join us in the afternoon November 18th to hear about Janis’s adventure. Our fall felting will be checking out Jean’s new felting “toys”. Four of us at a time can make (unfinished size 2ft x 2ft) squares of felt fabric in the felting machine in minutes vs all day. You can make as many squares with about 4 layers of fiber as you like. Plus we will see some of her other industrial tools (e.g the 24 inch carding machine and the cord maker). If you would like to do flat wet felting and not need to do the shuffle and jive please join us. Contact Gail Trotter for location and other details. Bring lunch and prepared fiber and optional yarn to craft as many felt squares as you like. Contact Gail Trotter if you need more information. Also let Gail know if you are interested in making the felt rocks for the ANWG guild booth floor. The booth team is interested in using the “stones” and “rocks” and they gave us sizes and amounts. We will “rock around the clock” after the new year.